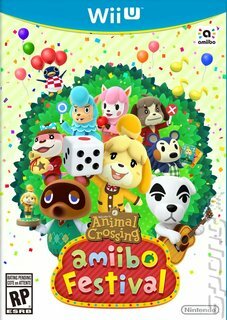 Animal Crossing: amiibo Festival is a digital board game set in the charming world of Animal Crossing. Anyone who knows the series will tell you that it's all about living in a unique, evolving town and interacting with the animal villagers around you. Now, players can experience it in a new way. Using amiibo figures from the Animal Crossing world, players can bring to life and control fan favourite characters such as Isabelle, Tom Nook and K.K., helping them make their way across the board in a quest to pick up as many happy points as possible. Players give the Wii U gamepad a quick tap with their amiibo to roll the dice, then away they go. Each space involves their character in a short sketch, bringing them and the town to life. It might mean them singing at the station for cash, hitting the shops or taking a wander round the museum. Each turn marks a new day of the month, and players can experience all four seasons in the town. As time progresses, new events will crop up for players to take part in, from Fishing Tourneys and Bug-Offs to the risky turnip trade. Happy points will change the characters as they're built up, too. They're saved to the amiibos and will unlock new costumes and emotions. Similarly, as you invest more time in the game new buildings can be constructed, so its rich world is constantly evolving.